페니케, 포르투갈의 프리서프 캡프 & 호스텔 | 호스텔월드에서 예약하세요. Freesurf Camp & Hostel is a new friendly hostel located in Ferrel, next to Baleal, Peniche, perfect location. We offer the possibility to our guests to take surf lessons with one of our certified surf teachers. After a day spent at the beach, nothing better than enjoy our amazing sea view over Berlengas Island on our terrace and relax in the pool while watching the overwhelming sunsets of the west coast of Portugal. A TV with cable channels, as well as a CD player are featured. Some units have a seating area where you can relax. Enjoy a cup of coffee or tea while looking out at the sea or garden. Freesurf Camp & Hostel has the perfect location for those who are looking for fun and relax at the same time. 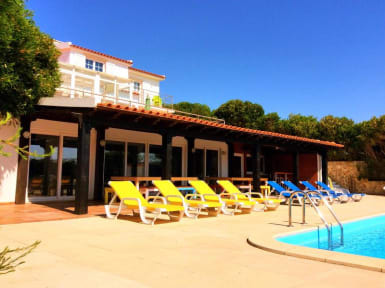 Situated in an agricultural reserve area, halfway between Almagreira and Baleal beach, Freesurf Camp & Hostel is close enough to allow our guests to enjoy all the beaches and nightlife of the area, without being bothered by all the hustle and bustle. We offer the possibility to our guests to take surf lessons with one of our certified surf teachers. After a day spent at the beach, nothing better than enjoy our amazing sea view over Berlengas Island on our terrace and relax in the pool while watching the overwhelming sunsets of the west coast of Portugal. The hostel offers private double rooms and also dorms with view over the ocean or to the garden. All rooms are decorated with a simple, modern and colorful style. Our dorms are equipped with individual lockers and reading lights. Free Wi-Fi available throughout the property. Payment types accepted at this property: cash, credit card and debit card. (Only: visa, MasterCard and Maestro).